The new Miyazaki movie, Ponyo On A Cliff By The Sea came to theaters while I was in Japan! I wish I had known... I didn’t end up seeing it, but since I’m a big Joe Hisaishi fan, I picked up the soundtrack before I left Tokyo. I’m a little disappointed because it’s not as melodically memorable as Hisaishi’s recent Ghibli soundtracks, but it still has lovely bits of his style and his richest orchestrations yet. I think my dismay comes from the movie itself, not Hisaishi’s talent - Ponyo seems to be geared toward a younger crowd than Miyazaki’s previous movies. As a result, its music sounds cheerful and heroic with open chords and harmonies, rather than mysterious and surprising like Hisaishi’s work on Spirited Away or elegant and breathtaking like that of Howl’s Moving Castle. 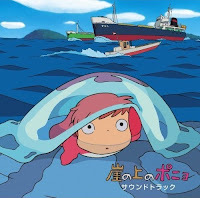 The Ponyo soundtrack is still fantastic and has many gems; I was just hoping that more of it would be like his other music that I’ve come to love. On another note (pun totally intended), I’ve been listening to Hisaishi’s Princess Mononoke Symphonic Suite a lot lately, specifically a track that I never paid attention to before - “The Forest of the Deer God.” It’s amazing. The Deer God’s theme in the movie is pretty simple, but the expanded symphonic version is a full exploration of the melody that borders on Stravinsky’s “Rite of Spring.” When your favorite film composer is capable of writing music like that, it’s inspiring to know that great movie soundtracks and great classical music can exist in the same world. Heh..dunno if you have actually watched Ponyo by now, but I really don't think it's for kids. I have never watched it (and do not intend to watch it either after I read the synopsis), but from what review I heard, it's actually extremely dark. A total betrayal of its whimsical art style, you might say. I heard its a very slow, very deliberate piece that focuses on selfish desire, death, and coming to terms with it. Definitely not kid's stuff. The piece itself is a work of art, a self-contradicting story about self-contradiction told in a very self-conflicting style. Sounds redundant, yes, but what good work of art doesn't when you describe them? Wow, that just makes the Ponyo soundtrack seem bizarre... The music is happier than most of Miyazaki's other movies, and its theme song sounds a lot like the Totoro song. Either way, it wasn't my favorite Joe Hisaishi soundtrack. I saw it with my baby sister and there's nothing dark about it. Cute characters, Cute music, Happy ending, No death, Good movie. "One Summer's Day" from Spirited Away is my favorite song of all time. Have you considered arranging it? By the way, do you think that theme sounds French?